It's almost too E-Z! Perfect for all of your mailroom needs, this heavy-gauge steel base supports up to 500 lbs. on extra-thick 1-1/2" legs. Height adjustable for standing or seated comfort. 150-lb. capacity bottom storage shelf with 14" clearance. Leveling glides help compensate for uneven floors. Top and Base sold and shipped separately-ORDER BOTH. Base Color: Gray; Overall Width: 60"; Overall Depth: 30"; Height Minimum: 28". Supports up to 500 lbs. on extra-thick 1-1/2" legs. Height adjustable for standing or seated comfort. 150-lb. 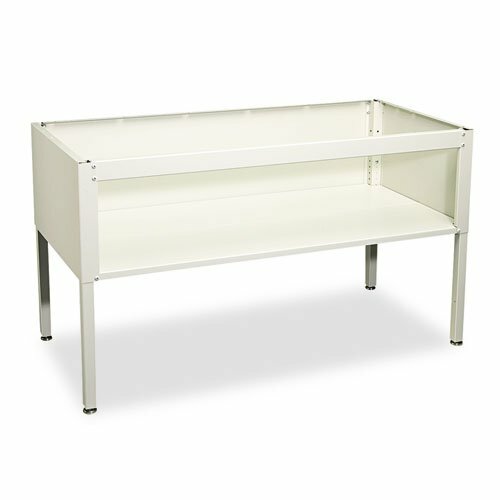 capacity bottom storage shelf with 14" clearance.